A number of runs are also taking place around South Jersey on Saturday and Sunday. 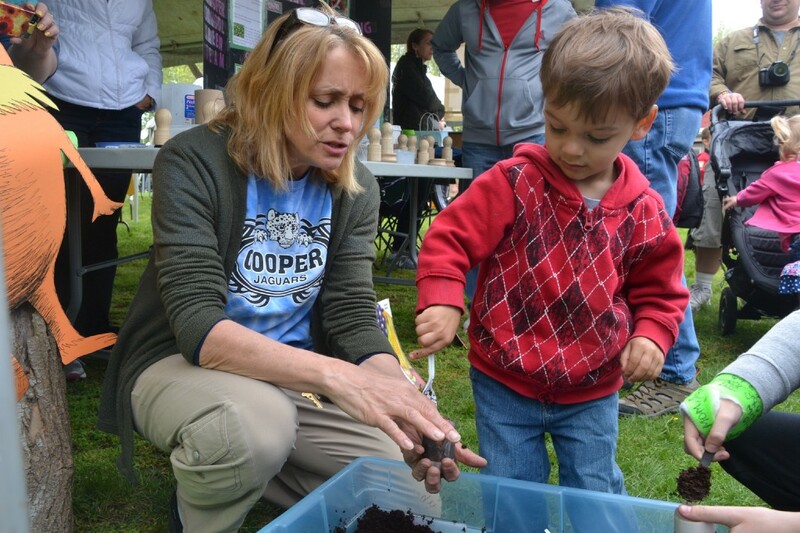 Cooper Elementary School teacher Linda Pezzella helps Patrick Lancos put some soil into a cup during an activity at the 2016 Sustainable Cherry Hill Earth Festival. The NFL Draft isn’t the only event happening in the Philadelphia region this weekend. If football isn’t your thing, check out what other activities are taking place around the area. Thousands will converge on Croft Farm Saturday for the eighth annual Sustainable Cherry Hill Earth Festival. The event will take place from 10 a.m. to 2 p.m. and will include more than 100 earth-friendly vendors and organizations, entertainment, food and more. The festival is free and open to the public. For a full list of activities, visit www.sustainablecherryhill.org. Those not going to Earth Festival can swing by Cherry Hill High School West on Saturday for the school’s Community Wide Yard Sale and Vendor Fair. The event takes place in the lower parking lot of the school from 8 a.m. to 1 p.m. All proceeds from the sale will benefit Cherry Hill High School West Project Graduation. There will also be a Ford Drive One 4 UR School activity at the sale. Participants 18 years or holder can take a few, no hassle test drive. For each test drive, $20 will be donated to Project Graduation. All are invited to this event. Medford Township is hosting its fifth annual town-wide yard sale and appreciation event on Saturday at Freedom Park, located at 86 Union Street. In addition to the yard sale, there will be a community appreciation celebration with free youth games and activities, refreshments and recycling giveaways. There will be a shredding truck in Freedom Park from 8 a.m. until noon. All sales and proceeds from the sale go to the participating individuals or community groups. Visit www.medfordtownship.com for more information. Community members will walk for a good cause at Voorhees Middle School this weekend in the Run and Walk 4 Family and Friends with Cancer. The walk will begin at 8:30 a.m., with registration opening at 7:30 a.m. The cost is $30 per person, with proceeds benefitting the Abramson Cancer Center at the University of Pennsylvania and the Samost Jewish Family and Children’s Service of Southern New Jersey Financial Assistance for Cancer Patients Program. To sign up or for more information, visit www.walk4ff.org. The Wild Half Race Series returns to Wildwood this weekend. The event consists of a series of races and fun activities will take place on Saturday and Sunday in Wildwood. Some of the activities include a Wild Child Run and 5K run on Saturday and a half marathon and 8K run on Sunday. The cost ranges from $40 to $120 depending on the race. For a full schedule of the weekend’s activities and to sign up for the races, visit www.wildhalf.com. Runners will also be in Atlantic City on Sunday to take part in the Seashore Gardens 5K Run and Health Walk. The event will begin at the Tropicana Casino and Resort at 9 a.m. Proceeds from the event will go to the Alzheimer’s Outreach Services of Seashore Gardens Living Center. The cost to participate is $30. For more information or to sign up, visit http://seashoregardens.org/5K. The 2017 NFL Draft will wrap up in Philadelphia on Saturday and fans will have one last chance to visit the NFL Draft Experience. The experience will be open from 10 a.m. to 7 p.m. on Saturday. Fans can enter on the Benjamin Franklin Parkway between 20th and 21st streets and enjoyed a slew of football-related activities. The experience is free to attend by downloading the Fan Mobile Pass app. To download the app, visit https://2017nfldraft.fishsoftware.com/prereg. A new street festival will debut in Philadelphia on Sunday. The East Passyunk Avenue Business Improvement District will present Flavors on the Avenue: A Street Festival on Sunday from noon to 5 p.m. The festival will take place along East Passyunk Avenue from Broad to Dickinson streets. The festival will feature food, drinks, live music and sidewalk sales. The event is free to attend and open to all ages. Food will be specially priced. For full list of participating restaurants and vendors, visit www.visiteastpassyunk.com.